Aston Martin is considered the coolest brand in the UK, thanks to its association with the James Bond films, a survey has found. The carmaker has come top in the latest study by independent brand research firm Superbrands, which questioned more than 2,000 consumers. In second place was Apple's iPod, followed by video website YouTube and Danish hi-fi firm Bang and Olufsen. 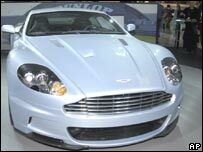 Back in March, US giant Ford sold Aston Martin to a UK consortium for £479m. "The success of Casino Royale - and the rekindled love affair between the British public and Bond as a result - shows there is a deeply ingrained association with the man and the car in the minds of Britons," said Superbrands. Based in Gaydon, Warwickshire, Aston Martin's current models include the Vantage and DB9 and this week it is displaying its new flagship, the DBS, at the Frankfurt motor show. The first James Bond film to feature an Aston Martin was Goldfinger in 1964. Superbrands said that in fifth place in its survey was search engine Google, followed by the Sony PlayStation games console. Computer-maker Apple was seventh, with the remainder of the top 10 being underwear firm Agent Provocateur, games console firm Nintendo and Virgin Atlantic. "The top 20 is a reflection of our changing needs, wants and interests," said Stephen Cheliotis, chairman of the Coolbrands Council. "You could argue that it's split into two pretty clearly-defined categories - on the one hand, things can become cool by virtue of their necessity or prevalence in your life, like Google or Amazon. "On the other, the things you really want, but may know you'll never get - like a Rolex or a Ferrari - are considered just as cool."